From a sketchbook with ruled lines on the right side, which was broken up in the early 1920s. Drawings from this volume, which numbered at least 55, are in the British Museum, the Metropolitan Museum (J. Bean and W. Griswold, 18th Century Italian Drawings in the Metropolitan Museum of Art, New York, 1990, no. 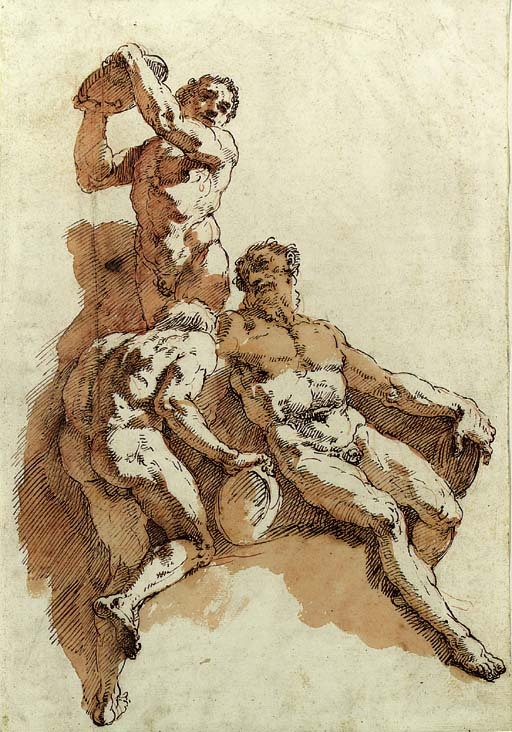 47, illustrated, as Fontebasso), at Princeton (F. Gibbons, Catalogue of Italian Drawings in the Art Museum, Princeton University, Princeton, 1977, nos. 211-4, illustrated, as attributed to Fontebasso), the Lehman Collection (J. Byam Shaw and G. Knox, op. cit., no. 60, illustrated, as Novelli) and elsewhere. Another study from the same album was sold in these Rooms, 6 July 1993, lot 100, as Fontebasso. James Byam Shaw attributed the drawings to Fontebasso in 1954, and he maintained the attribution, surely correctly, despite attempts to assign the drawings to the youthful Pietro Antonio Novelli.